Kill it! Kill it hard! How adorable! :D I just want that tiger to wake up and realize there's some live prey in it's cave, though. Wow, that's not really a photoshop job, is it? wonderful. i'm melting on the inside. okay - what's up with the striped vests?! Hey!! Tiger! No, wait! I think that's Piglet! Now THAT is some Picnic!! Poor Pooh,he's missing this!! their tiger suits are the best! hey, lorrie, when did u join? sorry,lorrie. that was so random of me. sssssooooorrrrrrrryyyyyyyyy! Aww I wanna eat them up! Ever watch "SNL" and the character "Debbie Downer?" I hate to be Debbie, but I think those are dead pigs that somebody at the zoo or habitat decided to use for a hoax. I hope I'm wrong, but the piglets look corpselike. And piglets are used for Tiger feed. Believe me, I'm the first one who wants to say "awwwwww" but I have a funny feeling about this one. On the other hand, I've seen some amazing animal combinations. I just wish the piggys didn't look so limp. I thought maybe they were dead pigs but then i realized how hard it would be to place dead pigs on top of a live tiger and get away with it. relationship tip 101 Ways to Build Happy, Lasting Relationships. Is that tiger sedated? Poor thing should be running around wherever it is that tigers are supposed to live. Well, see, Hannah, that's the problem. Tigers' habitats are disappearing at an alarming rate. Unless things change drastically, pretty soon the ONLY place anyone will see tigers is in captivity. But perhaps breeding them in captivity is better than letting them go extinct. i love piglets I want one soooooooooooooooooo bad. What I see is a very contented surrogate mama!! That is so awesome. I just love tigers. Here's another link with some (disturbing, if accurate) info behind the pictures. In the top photo, look at the edges of the piglets. Looks Photoshopped to me. 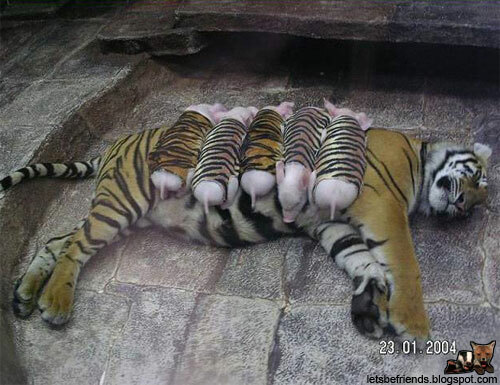 Also, supposedly this tiger is feeding these piglets. You can see the tiger's belly in the top photo, and this is clearly not a lactating tiger. They are real alright I have seen pics of the tiger walking around with the piglets on another site, they are not dead, animals in captivity are different then wild animals, my rotti loves my cat and that is unusual to see a rottweiler kissing a cat. unfortunately, it's real. Sriracha zoo in Thailand. They were closed down temporarily in 2004 for allegedly breeding tigers for commercial export. There's a black market in China for tiger parts. During that time, more than 80 tigers died of the avian flu, as they were fed chicken carcasses. These photos depict their attempts 'domesticate' tigers to enough of a degree that they will tolerate the humiliating demand to entertain people. Sad, really. Check out this website about this photo. It's www.snopes.com/photos/animals/tigerpig.asp. It tells the REAL story about this picture. This email forward arrives with photographs of a mother tiger suckling several piglets cutely clad in "tiger" suits. The message claims that veterinarians at a Californian zoo introduced the disguised piglets to the mother tiger in an effort to alleviate her depression after she lost her real cubs. The photographs are genuine. However, the explanation is a work of fiction. The zoo features a tiger circus and a variety of displays and shows designed to entertain guests, including crocodile and elephant shows, pig racing, "the genius pig that can calculate in 5 languages" and "Scorpion Queen, the girl with over 100 scorpions on her body". In spite of the claims in the email forward, the tiger suited piglets were not given to a grieving mother tiger to help her depression. Instead, they represent a callous manipulation of animals for the gratification of their human visitors. Other photographs show the piglets interacting with a tiger without their "tiger" disguises, so the tiger suits are clearly to increase the entertainment value of the display and are not really required. Photographs also depict a mother pig returning the "favour" by suckling tiger cubs. It seems apparent that the author of this email forward has simply invented a touching story to suit a set of rather intriguing images. The photographs are certainly interesting. However, they do not depict an act of kindness by concerned humans intent on helping an animal in distress as implied in the message. Instead, they exemplify out unfortunate willingness to exploit our fellow creatures for our own selfish purposes. Someone didn't think their plan all the way through. 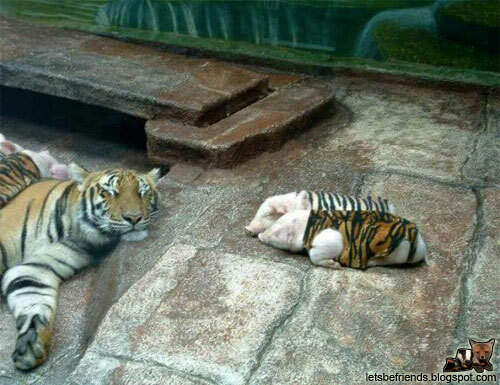 This tiger piglet combo actually lives in a zoo/circus in Bangkok. It's part of the "attraction". Both tiger and piglets ARE alive, but the tiger (as a cub) was nursed by a pig. 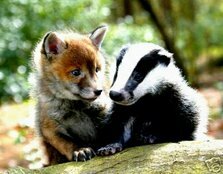 They are "friends" and if you look around on the web you can find more photos of them playing together. Apparently this zoo/circus in Bangkok has become very successful for its strange match-making abilities. What people will do to make a buck. I think this is so funny, how the pigs are dressed, its genius. here is the real story. still nice, interesting, but different, and potentially problematic. but yes - they are all alive and do get along. 3 days after the first picture .... The remaining 2 poor piglets queueing for tiger`s fourth and fifth days meal. I want one of those piggy vest for my doggy. They are exhibited at a Thai animal entertainment centre where the life expectancy of the tigers is very short. The animals are not treated well and they are exploited for entertainment and not for conservation. While this picture is very cute...let's be realistic. Those piglets look like they are wearing tiger fur and we all know tigers are on the endangered species list and have been for quite some time due to poaching, human encroachment on habitat etc, etc. This is safari world in Thailand, and is one of the most notorious well known animal rights violators internationally. Heya i love this picture but what happens if one of those stripe outfits falls off?? Bacon anyone? Whew!!! i have been seeking for such a vest for a long time. Where did they bought them???? Cute! WHo woulda thunk? Wrightbyname, whoever that is, is so evil! Poor little piggies! Don't kill it! Rob, so what if it's a photoshop job? It's adorable! awesome buddy. so cute i just love it. wooowwwww!!!!!!!! this is sooooooo sweeeeeeeeet. hope its real , its really great. awwwwwwwwwwwwwwww mannnnnn that's soooooooooooo sweettttttttttttttt. Simply adorable. interesting, the tiger just thinks that those are her/his own kind cuz of the same fur pattern on the piglets? The tiger vests hahahaha. To maintain the illusion otherwise they might end up as dinner. I love tigers. It looks so sedate, whatever the deal behind it is. Show me a Tiger walking around a circus ring with piglets on his back, dressed as cops. You guys need to get out more. Start with the next room, tomorrow go to the park, feed the ducks. There's no need to be anonymous. ewwwwwwwwwwwwwww that look real is it. what's up with the dress code!!? There's a pic of tiger cubs looking with marvel at a bunch of chicks that wandered into their cage in Singapore Zoo, I think. You must get that! It's real and i've been to the zoo. They have a really cool Tiger show there too. They have tigers walking on hind legs and everything. It's awesome. Oh and forgive me if i don't QUITE buy all the links to the websites run by animal rights yahoos. Your most beloved housepet is "abused" in their eyes.